I thought I had a good idea of what to expect from Ark: Aberration: collect resources, piece together gear, and traverse a new hostile environment, all while building increasingly elaborate contraptions. My assumptions were correct, to an extent, but I was also in for a shock. Aberration is a terrifying experience – much more so than the main game ever is. Having a hard time in the new expansion? Check out our Ark: Aberration tips guide. Ark: Survival Evolved taps into the wonder of exploring a vast, flourishing landscape. Sure, there are a couple of nasty beasts wandering the forests and plains, but nothing that would haunt your dreams. 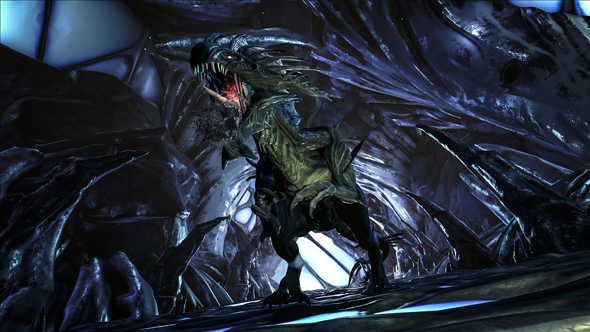 Aberration, on the other hand, throws you out of the sunlight and into a damaged Ark that is leaking radiation. The only creatures here are horribly mutated, boasting new movement abilities to keep you guessing, and even the flora is deadly. Aberration has a distinctly alien atmosphere. The map swaps natural colours for a neon palette, with some areas cast in a perpetual darkness, such as The Grave of the Lost, where you can easily get trapped if you are not careful. Even at a visual level, Aberration feels so much more oppressive than the base game. As you explore the subterranean environment you have to constantly find ways to light up your surroundings, using aids like Bulbdogs and charge lanterns. This is not simply to make it easier to navigate as Aberration gives you a reason to fear the dark. 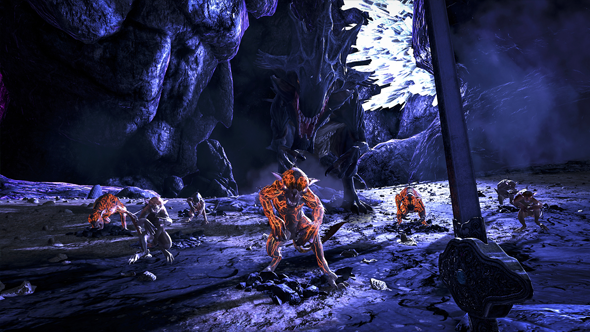 The light repels enemies like Nameless, which appear in packs whenever the environment falls into darkness, aggressively hunting down survivors. 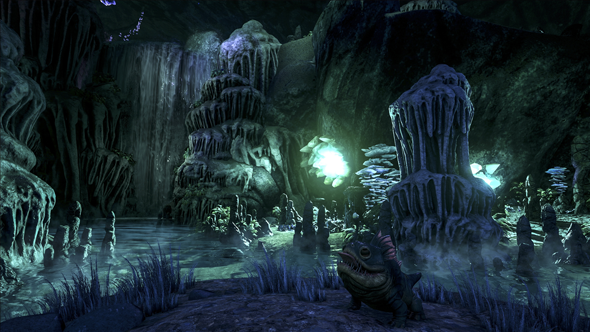 The Nameless are only the start to the new predators you will find in Aberration. Whereas Survival Evolved pulled from Earth’s own biological history for its creature designs – dinosaurs and extinct beasts aplenty – the new expansion features a number of unnerving creations that are unlike anything to have graced the game before, and with a greater number of teeth to rip you apart with. The Reaper Queen, in particular, is pure nightmare fuel. It impregnates you with an embryo that bursts out of your chest cavity, aping the gruesome reproductive process of the xenomorphs in the Alien series. I have had this happen to me and can confirm that it is as horrifying as you would imagine, if not worse. Exacerbating your horrendous condition is the timer ticking down in the corner of the screen, which serves as an indicator of when your bundle of joy will arrive, ripping its way out of your twitching torso. The Karkinos is another disturbing creature in Aberration. It is a huge crab-like beast that can pick you up and devour you whole. You may be tempted to toy with it given its slow movement but it is incredibly unsettling in action. It will drown you if you’re not careful, and can break your bones by throwing you against the environment or smashing you into the ground. Though its name draws inspiration from Greek mythology, it’s this sheer power and freakish design that call to mind the horrifying bugs from Starship Troopers, which eviscerate their enemies in a similar fashion. You only have to run into it once to be convinced to keep your distance in the future. The relatively simple task of travelling is also much harder in Aberration. You have to scale walls with climbing picks and glide across the environment from up high as it contains deep caverns and sheer rock faces. At a practical level, that means there is a whole new level of preparation involved in getting from A to B. You have to pack the right gear, stock up on food and water, and bring light sources before heading out. Ignore any of these steps and things quickly go downhill, sometimes literally, with you tumbling straight into a nest of nightmares. On one occasion, I forgot to pack enough picks and became trapped down in the lower chambers. Whereas, normally, I would be able to walk back up, finding an incline along the cliff wall, the sheer verticality of the map meant that I was trapped and would have to fend off some of the nastier creatures and craft a temporary outpost to repair my climbing equipment. However, everywhere I turned there were new threats: Reapers, Nameless, and the flying Seekers with their squid-like faces. I did eventually get back up, but it took two days of hard graft on my part, with the constant fear always playing on my mind that I would fall victim to some terror of the deep. 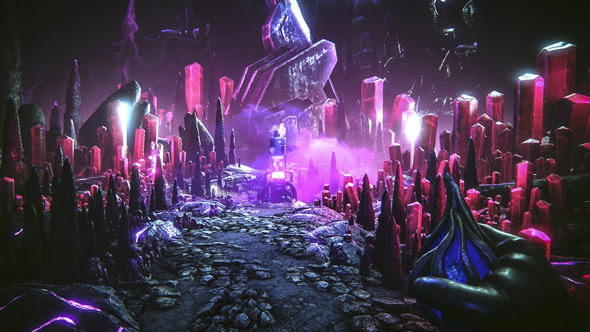 Aberration succeeds in delivering a brand-new experience in Ark. I was surprised by just how different the tone was, and how it affected the way that I played. Venturing deeper underground, I was more cautious than on other maps. I barely saw another player. And when I did, it was usually running away in terror from some creature. The isolation is a big part of its appeal. After all, if the map was more densely populated, as with the base game, then you would feel more protected and less likely to take risks. With Aberration, though, you never know what is going to happen and so you are always on guard, aware that no-one will hear you scream and come running to save you.